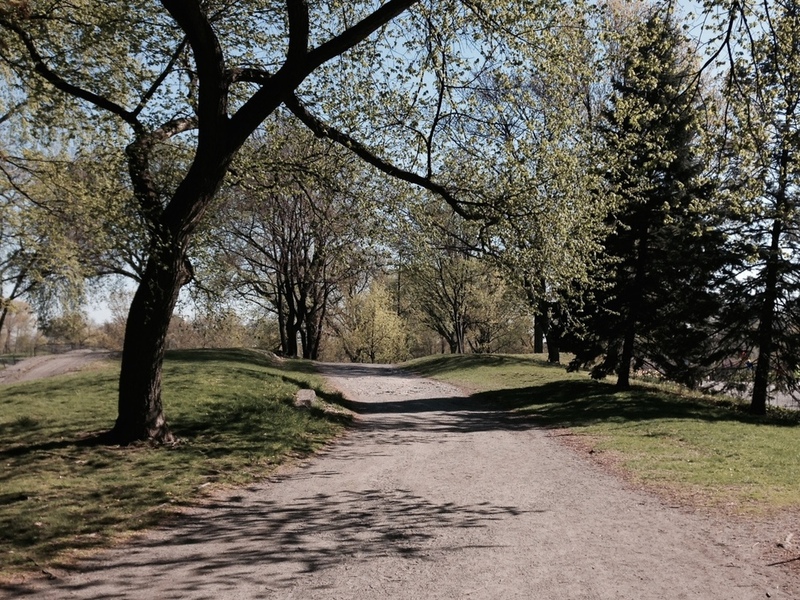 Did you know that you don't have to run on pavement in Central Park!? It recently came to my (Jessica) attention that this is not widely known by everyone, so I'm here to inform (or remind) you about the Bridal Path. It is a little hidden gem in Central Park that offers more shade and significantly less people than the main running loop and it's dirt! Check out the picture above that I took last Saturday at 9am - there's no one on it! Also, unlike the bridal path in Prospect Park, which is hard to run and truly for horses, the bridal path in Central Park is definitely runner friendly. Similar to its neighbor, the road, it's packed with undulating hills that are great for training. If you run the full bridal path loop, you can get almost 4 miles of trails. If you're running counterclockwise around the park, enter the bridal path at the south-eastern corner of the reservoir. Stay on the lower trail that circles the reservoir and then as it begins to break hard left, take a hard right turn to stay on the path parallel to the road. This winds you up and across the 102nd Street crossing (along a dirt path of course) and then you can follow the path all the way down the west side of the park until the Columbus Circle exit. Here's a map of all the trails with the bridal path identified by the white dots. Next time you're in Central Park, take the less traveled and more serene route along the bridal path. It's amazing. It seems crazy to think back to this time last year - I had just given birth to my daughter and was in major recovery mode. At that time, all I could dream about was getting back on the trails in Forest Park, but I knew there was specific work to do before I laced up my running shoes and hit the trails hard. I knew this mainly because I am lucky enough to work with fitness professionals and therapists who taught me how to return to running the right way postpartum. With targeted strength work, expert advice and a lot of patience, I'm running stronger and faster than I have in years. This week alone I hit the flat trails for speed, the hilly trails for a mid-distance run and am looking forward to a 20-miler this weekend which will include plenty of undulating trails. In the last month, I finally feel like I beat pregnancy! A dear friend and amazing Pilates instructor, Frances Darnell, once told me that it usually takes her clients about a year of hard work to feel comletely like themselves again after pregnancy. She was right in my case. 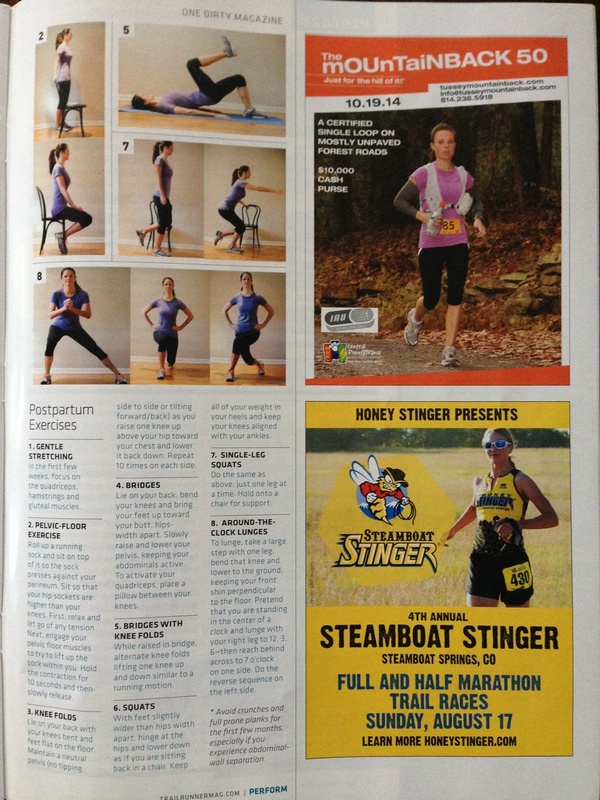 She also had a lot more to say in the article that I wrote in this month's Trail Runner Magazine, "Hitting the Trails After Pregnancy." Whether you have access to a track should not determine whether you are able to complete your track workouts during marathon training. Certain workouts are designated for the track because a track provides precise, quarter-mile distance markers and a flat surface perfect for uninterrupted running and accurate feedback about your pace and times. Unfortunately, it’s not realistic for a lot of people to get to a track once a week for their track workouts. For some, it’s because a track is not nearby, and, for others, it’s because the thought of running around a track is very unappealing (to the latter, I recommend training in a group at the track - it's much more motivating). Whoever you are, if you can’t get to a track, try these two alternatives to the track to get the most of out of your designated "track workouts." 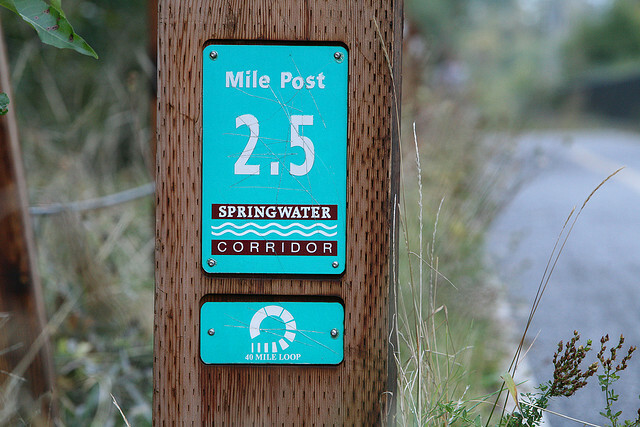 (1) Find a flat pedestrian path or trail with quarter-mile markers. Most track workouts can be broken down into quarter-mile distances such as 400s, 800s, 1200, 1600s, etc. Many cities have running paths with distance markers. With the distances all marked out, all you need is a timer to track your workouts. If your city doesn’t have a path with distances marked out, don’t be afraid to bring some chalk and make your own during your warm up. (2) Set up your GPS watch to auto lap at .25 miles rather than 1-mile. This works well when you can’t find any distance markers. Plus, it provides you with your quarter-mile splits during longer speed intervals. This is important because it allows you to monitor whether you are running at a consistent pace or starting out slow and finishing fast or vice versa. Jessica and I are fortunate enough to live in a city that has a park with 70 miles of trails - yup, you read that correctly! Forest Park, in Portland, Oregon, is a magical, inspiring, incredible and sometimes, well most of the time, a humbling place! The hills can be unrelenting depending on the trail you choose. It's worth the pain because you feel as if you are a million miles away from cars, phones and noise. We love running in Forest Park however, early in our training season, it can take a lot of motivation to get us there. To keep us motivated, we signed up for a hilly half-marathon in July, thus we need to run hills! We also signed up for a trail race series. It's a fun, casual race environment but what is great is that because there's timing and a group of people, we naturally run faster. 1) Sign up for a series or a trail running group - strength in numbers! 2) Start small - no need to conquer an 8 mile trail run or the hilliest route on your first couple of runs. 3) Sign up for a hilly race - this will force you to train on hills. 4) Take your watch off - don't let your slower pace distract you. Just head into the trails and run. 5) Instagram your runs - you will make all your friends jealous! Have fun in the trails!